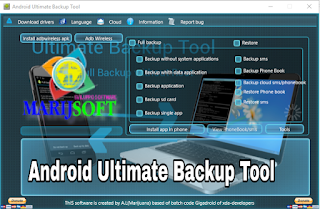 Android Ultimate Backup Tool is a small application for windows computer which allows you to backup the android device without the system applications, backup the device with data application, backup the android application, backup the Sd Card memory, backup any specific single App. 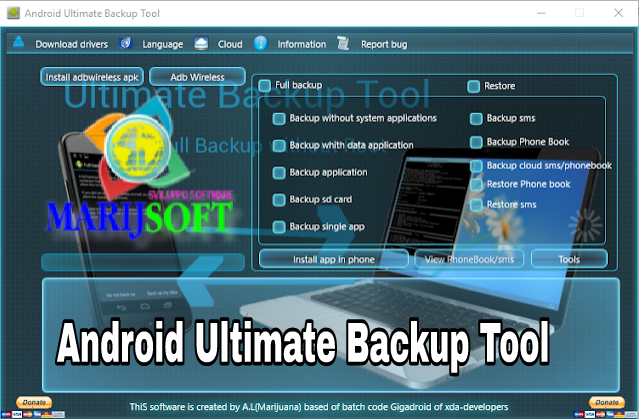 It also allows you to backup the SMS messages, backup the phonebook (contacts) , backup the cloud sms and phone book, restore phone book, restore sms. It also allows you to install app in the android device, view phone book or contacts, view sms or text messages, install adb wireless apk, enable adb wireless.